Twigs with hornets' and birds' nests, and a beaded ornament. Also cross section of a bird's nest. bl.uk > Online Gallery Home	> Online exhibitions	> Asia, Pacific and Africa Collections	> Twigs with hornets' and birds' nests, and a beaded ornament. Also cross section of a bird's nest. 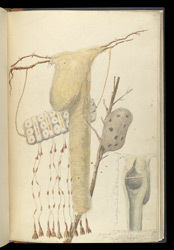 Pencil and water-colour drawing of twigs with hornets' and birds' nests, and a beaded ornament with a cross section of a bird's nest by Joseph Scott Phillips (1812-1884) in 1833. This is from an album of drawings (46 folios) made in 1833 while Phillips was a supernumerary Second-Lieutenant at Dum Dum. They are mostly views, some covering a trip through the Sunderbans to Dacca, in pencil or water-colour, with a few removed, leaving inscriptions. This drawing is inscribed: 'Ornament or charm from the tomb of the Beji Bore Dacca. Formation of a kind of Hornets nest from a piece of Sola growing in water. Pendent birds nest of the sparrow [tu...illeg.]. Egg pure white, size of a swallows. 1834. 1/2 natural size'.